If your skin has developed a rash, bumps, or irritation, you should consider the signs of the skin virus molluscum contagiosum. Molluscum contagiosum virus (MCV) is a common skin infection that is easy to spot, however it is sometimes mistaken for other skin diseases. What are the main differences between MCV and other skin viruses? Pink, Round Bumps – Most bumps are white, pink or flesh-colored with an indention in the center. Typically, bumps range from 2 to 5 mm in size and may be red, itchy or sore. Grouped Together – Notice the pattern of your bumps. Usually MCV results in 10 to 20 bumps that are grouped together instead of sporadically found on your skin. In some cases, you may observe up to 100 bumps. 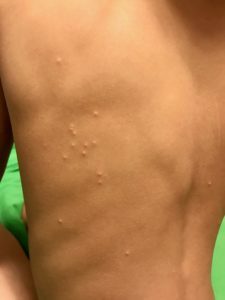 Where Bumps Appear – Molluscum contagiosum can appear anywhere on your body, but is usually identified on your face, torso, neck, armpits, and genital areas. Unlike warts, molluscum virus is not found on the palms or soles. See our pictures of molluscum to help identitify these bumps. Highly Contagious – Molluscum spreads quickly through skin-to-skin contact, shared items, or scratching or picking bumps. While some skin viruses disappear in a matter of days, without treatment MCV will last on average 6 to 12 months. For more information, visit our helpful links and resources. How can I treat molluscum contagiosum? Learn more about the MolluscumRX ingredients or order your treatment today! I am from India and living in Nashik near bombay. I would like to know how can i order MolluscumRX. You can simply order off the website.